Today in Masonic History George Lafayette Beal passes away in 1896. George Lafayette Beal was an American solider and politician. Beal was born in Norway, Maine. His father was the founder of the town. Beal studied at Westbrook Seminary and was always interested in Military affairs. When the American Civil War broke out Beal was the first man in Oxford Country, Maine to sign up for service. Beal was already a member of the Maine Militia and his unit became Company G of the First Maine Infantry Regiment. The First Maine was a three-month unit. A three-month unit was enacted by President Abraham Lincoln requiring Maine to supply troops for three months of federal service. Beal had an active career during the civil war and participated in several campaigns. At the end of his tour he re-enlisted and was promoted to Colonel service with the 10th Maine Infantry. With the 10th Beal was present at the Battle of Cedar Mountain among other battles. 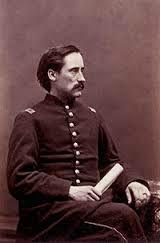 For his efforts in the Battle of Cedar Mountain he would be promoted to Brigadier General in 1864. After the war Beal was sent to South Carolina to and was assigned the Eastern District during the Reconstruction era. After Beal's assignment in South Carolina was complete he returned to Maine where in 1868 he became a delegate from Maine for the Republican National Convention which nominated General Grant for President. In 1880 Beal became Adjutant General of the Maine Militia. In 1888 he was elected State Treasurer and served until 1894. Beal was a member of Oxford Lodge No. 18 in Norway, Maine.